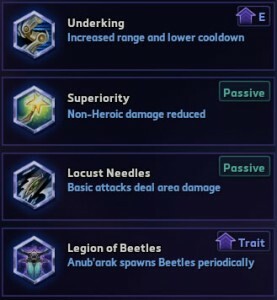 Anub’arak, the undead beetle from Warcraft universe is making his appearance in Heroes of the Storm as well. He’s a Warrior class Hero who excels at tanking entire teams and has a wide range of useful abilities to help his team to victory. To those who played the Undead in Warcraft III some of the ability names and overall playstyle will definitely be familiar, and my Anub’arak build guide will outline his strengths and weaknesses and show you how to best play him in Heroes of the Storm. If you don’t want to be Anoob’arak read my guide and learn more about his abilities, heroic spells, talents, and more tips and strategies you can use to dominate your opponents. Disclaimer: the recommended talents are based on my personal preferences and play style, and are by no means the only way to play Anub’arak. 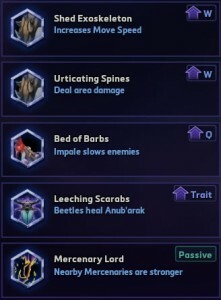 It’s intended for newer players looking for a quick guide, and once you start grasping Anub’arak’s basics you should experiment and see what works for you! Choice of talents may also depend on map or team composition. 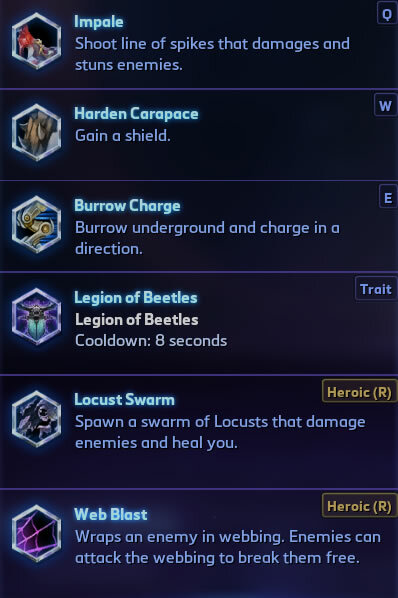 Trait – Legion of Beetles: Whenever Anub’arak casts a spell he summons a beetle for 10 seconds. Q – Impale: Shoots spikes in a straight line dealing damage and knocking enemies caught into air. 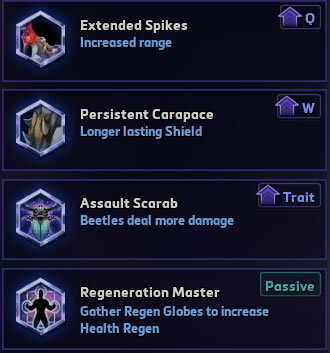 W – Harden Carapace: Anub’arak gains a small duration shield which absorbs all damage. E – Burrow Charge: Burrow underground and charge in a direction, and stuns enemies around resurface point. Can be activated during traveling. R – Locust Swarm: Deals AoE damage every second around you, and heals you for each enemy damaged. R – Web Blast: Wraps a targeted enemy Hero into a cocoon, disabling actions and making him untargetable. For more advice about which Heroic (R) ability to pick, refer to “Level 10 Talents” further down. Below we’ll take a closer look at talent choices at levels 1, 4, 7, 13, 16, and 20. If you want to find out which talents are best on Anub’arak and which ones to pick and avoid be sure to take a look at each section. Extended Spikes – Impale (Q) has 25% increased range. Persistent Carapace – Shield (W) lasts 3 seconds longer. Assault Scarab – Beetles (trait) deal 25% more damage. Regeneration Master – Gathering Regeneration Globes permanently increases Health Regen. Extended Spikes and Regeneration Master are both good choices. Most often I prefer taking Extended Spikes, ensuring enemies have a much harder time getting away from you. 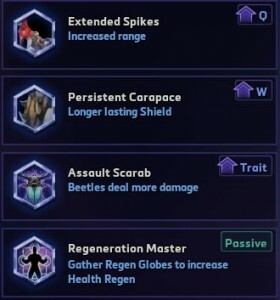 Regeneration Master can be very helpful since Anub’arak has little sustain to keep him in action until his ultimate abilities, but since it doesn’t give you any combat stats nor utility it’s often best skipped. Your Harden Carapace (W) shield doesn’t absorb a huge amount of damage, and the default 3 second duration is usually more than enough time for enemies to break through it anyway. Assault Scarab is not recommended. Underking – Burrow Charge (E) has 20% increased range and 2 second lower cooldown. Superiority – Reduces all non-Hero damage taken by 50%. Locust Needles – Basic Attacks deal 50% splash damage to nearby targets. Legion of Beetles – Anubarak automatically spawns a Beetle once every 8 seconds. Wonderful choice of level 4 talents will require a bit of thinking from your part. 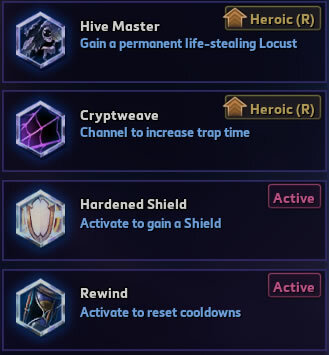 Besides Locust Needles which I avoid taking, all other talent choices at level 4 are very good and often depend on your team’s composition, enemy Heroes, map you’re playing on, and whether you’re in lane solo or with another player. Let’s take a look at the pros and cons of each talent. Underking is very good if you’re looking for even more reliable crowd control in fights. Paired with the talent Extended Spikes at level 1, you can catch up to anyone if your cooldowns are up, and easily get to the enemy team’s backline damage dealers to keep them busy. Legion of Beetles can be extremely useful for fast pushing structures. Summoning Beetles once every 8 seconds quickly expends tower and keep ammo and helps with damage, albeit slightly. Lastly Superiority is possibly the best choice. Anub’arak is all about tanking and soaking damage anywhere he can, and with this one talent his becomes incredibly durable when taking down mercenary camps, bosses, and even structures. It’s usually the superior choice and if you don’t think you make the most out of other talents go for Superiority. Shed Exoskeleton – Increases the Scarab’s movement speed for 3 seconds after using Harden Carapace (W). Urticating Spines – Casting Harden Carapace (W) deals AoE damage around you. Bed of Barbs – Casting Impale (Q) leaves a trail for 3.5 seconds dealing damage and slowing enemies standing on it. 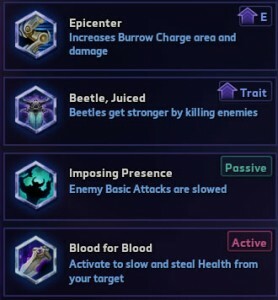 Leeching Scarabs – Nearby Beetles summoned by your passive trait heal you for 50% of their damage dealt. Mercenary Lord – Siege and Bruiser Mercenaries around you deal 50% more damage. Shed Exoskeleton or Bed of Barbs are top choices on level 7, with the former being my most common choice. Since your W shield only has an 8 second cooldown you can constantly speed yourself up allowing you to both catch up to enemies or escape from them. Bed of Barbs can be helpful for additional crowd control capability. Notable choice are also Leeching Scarabs, which can in fact heal for a decent amount especially if you have Legion of Beetles level 4 talent (spawning Beetles every 8 seconds), or if you didn’t take Regeneration Master talent at level 1. 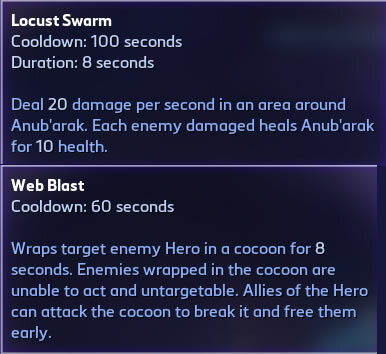 Locust Swarm: Damages enemies around Anub’arak and returns health for each enemy damaged. 100 second cooldown and 8 second duration. Makes you incredibly durable, and unless focused by an entire team you can absorb a ton of damage all the while dealing damage to everyone around you. 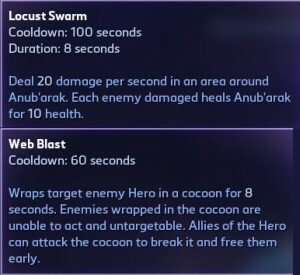 Web Blast: Wraps target enemy Hero in a cocoon for 8 seconds. Cocooned enemy is unable to act and can’t be targeted, and his allies can attack the cocoon to break them free early. Strong single-target CC, can easily take out an opponent out of the fight and make it essentially a 4v5. When used on a support or squishy damage dealer this Heroic can easily swing the fight in your favor, but Web Blast is best used in coordinated teams who can properly take advantage of this 8-second duration CC. For everything else there’s Locust Swarm. It has immense healing giving you more than enough sustain during teamfights, and considering the overall durability of the scarab lord this ultimate will make everything think twice before focusing their damage on you. 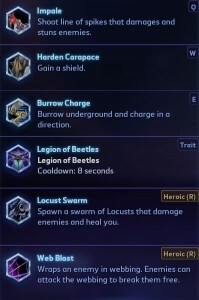 Paired with a level 20 talent you can also have a near-permanent Locust Swarm giving you constant heals. Burning Rage – Continuously deals damage to enemies around you. Chitinous Plating – Increased Hardened Carapace (W) shield amount by 40%. Symbiotic Armor – Using Hardened Carapace (W) also gives a shield to summoned Beetles. Spell Shield – Reduces consecutive spell damage once every 30 seconds. Burning Rage is what I do with in most matches. Due to Anub’arak being so durable you can usually stay in fights very long, and Burning Rage can continually melt enemies around you. With various forms of crowd control and gap-closers at your disposal you can easily stick to your desired target, and Burning Rage makes you a much bigger threat to them. Alternatively if you’re feeling too squishy you can go for Chitinous Plating, increasing your W’s shield by 40%. Or, if caster assassins are causing you issues Spell Shield can also be a good alternative as it helps tremendously in decreasing potential burst damage you take. Epicenter – Increases Burrow Charge (E) area and damage. Beetle, Juiced – If a Beetle kills an enemy it heals to full health, gain double the normal damage and health, and has refreshed duration. Only occurs once per Beetle. Imposing Presence – Passive skill slowing enemy attack speed by 50% whenever they attack you. Blood for Blood – Active spell stealing 15% of target Hero’s max health, and reducing their movement speed by 30% for 3 seconds. I never take Beetle, Juiced, and Epicenter is sub-optimal in my opinion as well. Blood for Blood or Imposing Presence are much more useful, and the choice depends on your and enemy’s heroes picked. If they have Assassins such as Valla or Zeratul who’s damage is almost entirely based on Basic Attacks, Imposing Presence is incredibly powerful. Taking it against ranged spell-casters like Jaina wouldn’t make much sense, but otherwise the usefulness of this talent can’t be overstated. Blood for Blood is an active spell many champions have access to and it can be very useful, though on Anub’arak I haven’t felt much need for taking it. Imposing Presence is definitely superior, but if you don’t require it Blood for Blood can make you even more annoying. Hive Master – You passively gain a permanent life-stealing Locust Swarm (R), dealing damage to nearby enemy and healing you once every 3 seconds. Cryptweave – Channeling on a Web Blasted (R) target increases the cocoon duration by 4 seconds. Hardened Shield – Active ability reducing all damage taken by 75% for 4 seconds. Rewind – Active spell resetting cooldowns of your Basic (non-Heroic) abilities. If you took Locust Swarm ultimate, then you definitely should pick up Hive Master. This constant passive heal is yet another incredibly useful weapon in your tanky/damage/sustain arsenal, giving you enough sustain to even solo Boss monsters on the map. I wouldn’t recommend taking Cryptweave even if you have Web Blast heroic spell. Both Hardened Shield and Rewind are more useful alternatives and either one will be a great choice, so choose whichever one you prefer or require. This is the build I go for in majority of my games. Sometimes I’ll go for full sustain build taking every health regeneration and life-stealing talent I can just to be extra annoying, but in most matches the build outlined above will work very well. As explained in more detail in section about every talent, you should consider all the factors when choosing talents, including the map you’re playing on and your team’s and enemy heroes picked. 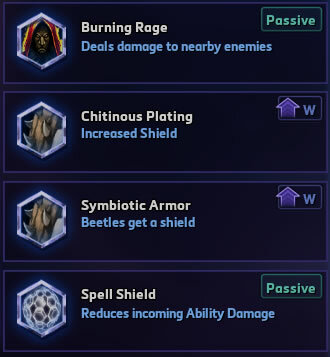 Anub’arak is a versatile and scary tank with a great choice of talents, and you can and should always adapt to the match as needed, rather than focusing always on certain talents. If you need a quick talent guide or if you’re ever in doubt, simply go for the recommended build above and I’m sure it’ll work well for you. Need more detailed Anub’arak talents guide explaining strategies, tactics, and other secrets you need to master this hero? Click here. Don’t forget you can unburrow while traveling with Burrow Charge (E). You don’t need to travel the full distance. Try to target Burrow Charge slightly behind enemy target, making sure you stun them and get a few basic attacks in while you’re at their escape path. Harden Carapace (W) has a fairly low cooldown and mana cost, don’t be afraid to use it whenever you can. Always chain crowd control from Burrow Charge (E) and Impale (Q), don’t use both at once. Locust Swarm makes you incredibly hard to kill, but that doesn’t mean you’re indestructible. You should make sure enemies focus you in teamfights, but still try to stay relatively safe and make use of your sustain and shield to live as long as you can. Being alive longer and throwing another stun can make all the difference. Don’t forget you can use Burrow Charge as an escape tool, and you don’t always need to engage with it. You can also travel across walls with it. If you have any tips of your own for playing Anub’arak, be sure to tell us in the comments after the guide. Of all the melee warriors in HotS, Anub’arak is potentially one of the most durable ones. He has amazing utility, survivability, sustain, and crowd control. 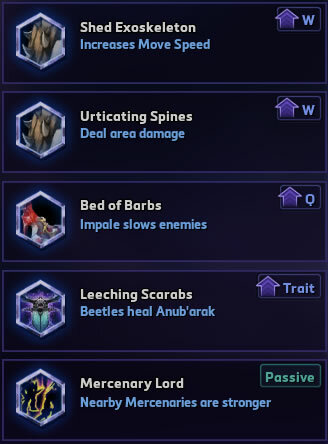 Although not often considered a top-tier pick I always like having (or playing) Anub’arak and I believe he brings a lot to any team composition. Do you have your own way of playing Anub’arak? Let everyone know how to make the most out of this hero in the comments below.